A quick introduction to Montrose and our services. 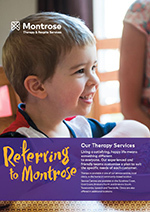 Montrose supports children and young adults with physical disabilities, neuro-muscular conditions, development delay and autism. Our therapy services include physiotherapy, occupational therapy, speech pathology, social work and therapy in schools. We also offer Daily Living Support, a Lifestyle & Leisure program, Short Stay Respite and accessible holiday accommodation. There are number of ways to access Montrose services including the National Disability Insurance Scheme (NDIS) and private health insurance. You can also choose to pay directly for the services you use. We can help you identify available funding. Find out more in our brochure below or just call us on 1800 193 362. Lifestyle and Leisure is all about you and getting the most out of life. Specially designed for young adults (16-35), it’s all about getting out, being active and learning new things. Build your confidence with one of our skills based programs and join one of our social groups for some fun! Our team have lots of experience working with people with physical disabilities, autism and other additional support needs and can help you get the most out of your choice of activity. Need a break, want to try new activities or enjoy the independence of spending time away with friends? Our short stay accommodation offers all of this. The service also provides valuable support for parents and carers by letting them take a break. And what a great location! On the Gold Coast close to theme parks, beaches, shopping, restaurants and so many other activities. Support in your home with personal care & general assistance, the provision of respite care or support with study. Support where you need it such as when attending a sporting event, chores at home, school, TAFE or Uni, going to the movies or out with friends. 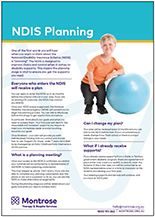 One of the first words you will hear when you start to think about the National Disability Insurance Scheme (NDIS) is “planning”. The NDIS is designed to improve choice and control when it comes to disability supports. This means the planning stage is vital to ensure you get the supports you need. 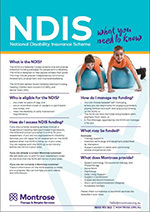 Find out the basics about the NDIS in this factsheet then call us on 1800 193 362 to find out more. Designed for health professionals and other agencies, this guide explains how we can help and how to refer to us. You can also view this information as a webpage here or simply call on 1800 193 362. 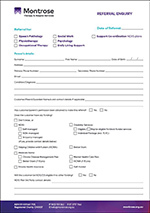 This is our referral form for health professionals and other agencies. Individuals and family members should contact us by email or directly on 1800 193 362. Referral information for the Non School Organisation Program can be found here. Our Annual Review looks back on another busy and successful year. Thanks to all those who supported us and to all of our customers and staff. Our key business strategy priorities for 2016 – 2020. Useful Information for travellers who need extra support or are flying with a wheelchair. Palliative care is a special type of integrated care that aims to support people to live well while they manage a life-limiting health condition. Transition planning involves thinking about and preparing for life after school and into adulthood.